Sales at garden centres across the country continued to soar in June (2018) thanks to the sunny weather according to the Garden Centre Association’s Barometer of Trade report. Outdoor plant sales were up 26.94% compared to the same month last year (2017) and sales in houseplants were close behind at 24.1% up. GCA Chief Executive, Iain Wylie said: “It’s hard to believe that earlier in the year we had such terrible weather, including heavy snowfall, which really affected sales, but recently we’ve enjoyed heat waves across the country. Seed and bulb sales were also up at 18.52%, garden sundries sales were up 21.17% and furniture and barbecue sales were up 19.82% compared to the same month last year. Sales were also up in pets and aquatics at 5.31%, gifts at 3.97% and hard landscaping at 13.11%. Non-traditional categories also did well, with food hall and farm shop sales up 7.05%, clothing up 18.53% and catering up 5.84%. Overall sales for the month were up 22.84% with a year to date change of 1.12%. Deputy Chairman at Squires Garden Centres, Sarah Squire said: “After a challenging spring in terms of weather delaying the start of the gardening season, May 2018 was our best-ever month and, although we had some concern over how well the season would extend into June, the sunshine encouraged people to get outdoors and enjoy summer. 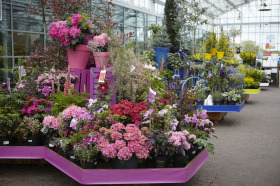 Managing Director at Bents Garden & Home, Matthew Bent said: “Sales in both outdoor plants and houseplants are up year to date, however it has been a tough month particularly for outdoor plants. The warm weather has definitely had an impact on footfall…it has almost been too hot! People are choosing to stay at home and enjoy their garden, rather than getting out and about to buy plants.